In her practice, Karen uses Resonance Repatterning and Spiritual Response Technique in her sessions. Both are very different and offer unique opportunities that are specific to anything that you might be working on in your life. Private sessions can be done in person or on the phone. In each session, the client's body-mind system determines what clearing system is needed to support you. Resonance Repatterning clears resonance with issues that are stored in your body-mind system while Spiritual Response Technique clears deeper levels of trauma, pain, and limitations held on the soul level but shows up as issues in the body-mind system. You can expect changes in each session~even in a short 30 minute session such as offered here. If you are new to either of these systems of work, treat yourself to a new way of addressing your issues. Often people say to me that they have done 10 years or so of traditional psychotherapy but in one session, they are amazed at some of the issues that might come up in such a short time. When the body-mind system is ready for releasing an issue such as trauma or unresolved hurts, either of the systems are fantastic to support you in your healing. Connecting with your Light and your soul's purpose is the goal of each session! Are you ready to connect with your Light? 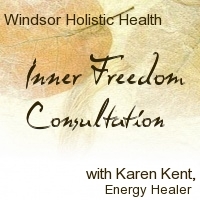 Give yourself 30 minutes now and book with Karen! See what is waiting for you when your blocks are cleared!